Good grassland management is absolutely fundamental to maintaining flower rich biodiverse meadows and grassland. In practice implementing the best mowing regime at the right time of year can be quite a challenge. This is particularly true of small to moderate sized areas of grassland in inaccessible locations. If you are able to find an operator with suitable machinery and persuade them to mow your grassland you often have to compromise as to when the area is cut and have the job done in one hit. Better control over when to cut. 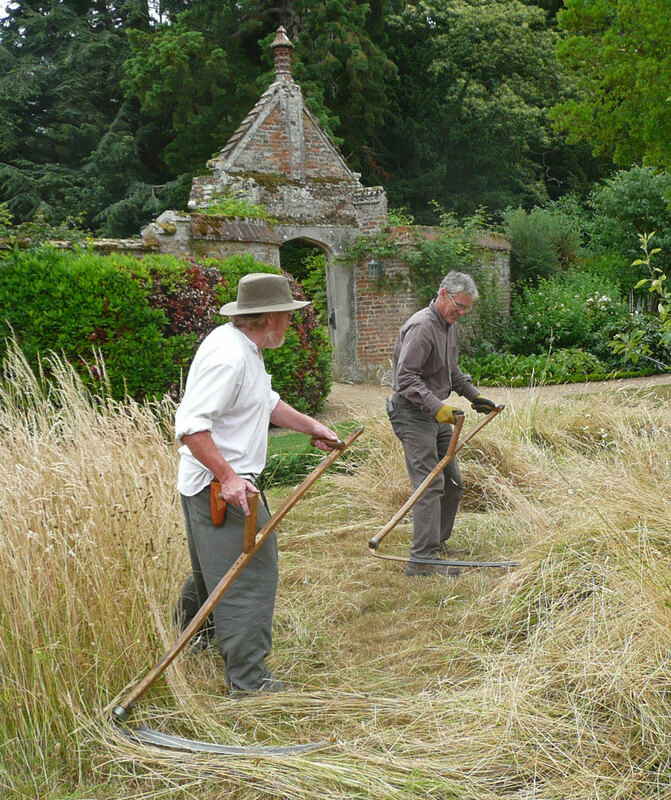 There are many additional benefits which you will discover if you adopt scything. For individuals and volunteer groups who want to work together as a team without the noise or health and safety issues associated with powered machinery. 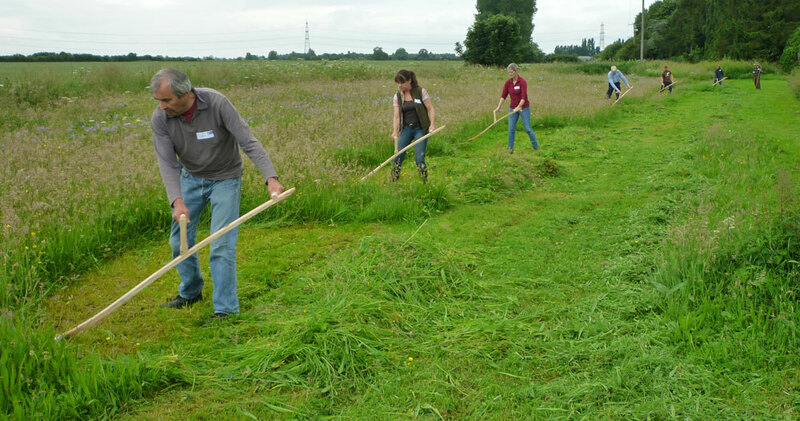 By staggering mowing and hay making over the season an individual novice should be able to manage up to 1/2 acre (2000m2) of meadow with a scythe, experienced mowers and groups can tackle larger areas. A competent mower can cut a meadow in less time than it takes to clear cut grass or make hay. Depending on weather, and how often you need to turn the hay, you will need to allow 2 -5 people per mower (or equivalent man hours) for turning, gathering, carting and stacking hay. Another reason for staggering the mowing schedule is to spread the workload: don't mow more in one day than you can handle. Even if you do not wish to save the hay for fodder it is good to at least partially dry the hay on the meadow before carting. This allows seeds to drop back and massively reduces the weight and volume of material to be carted off (as over 80% of the weight in fresh cut grass is water). Always clear cut material from grassland otherwise its structure and diversity will suffer. Scythe cut grass is nicer to handle than the mashed grass left by many mechanical mowers. A scythe is a surprisingly ergonomic tool to use provided it is of the correct size with proportions matched to the user. 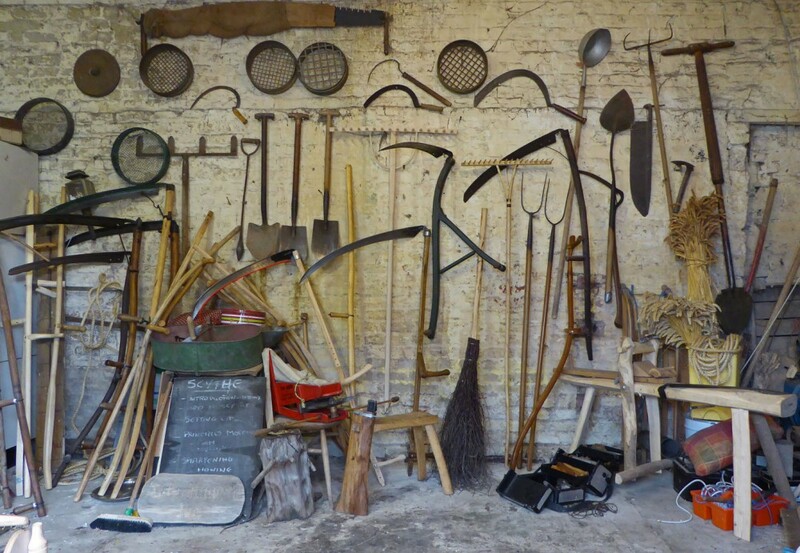 Old second hand ‘English' scythes are rarely configured to suit a modern user. Modern ‘Austrian' scythes are usually a better option as they are a lighter and more refined tool. The scythe sets we offer are adjustable and so can be set up correctly to fit individual users and are available with a choice of blade types to suit different mowing and trimming tasks. 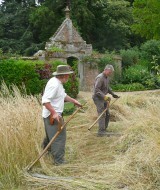 To use a scythe efficiently and safely you will also need to acquire basic mowing skills. The best way to learn mowing and sharpening techniques is by instruction. 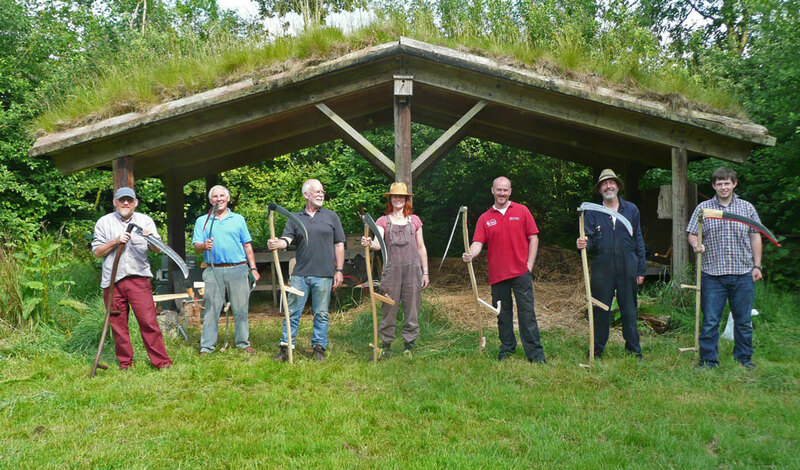 There are now a number of scythe instructors around the country offering courses, including some through Emorsgate here in East Anglia see courses. A one day introductory course should teach you enough to be able to return home and get your grass cut. Efficient mowing however will take time and practice to develop; this is where further guidance and instruction from experienced mowers can be helpful. The scythe association organises a number of meetings and festivals though the year where you can get free advice and guidance. There is also quite a lot of useful information available online and in print to refer to. Stay sharp. Mowing with anything less than a keenly sharpened blade is both difficult and hard work. 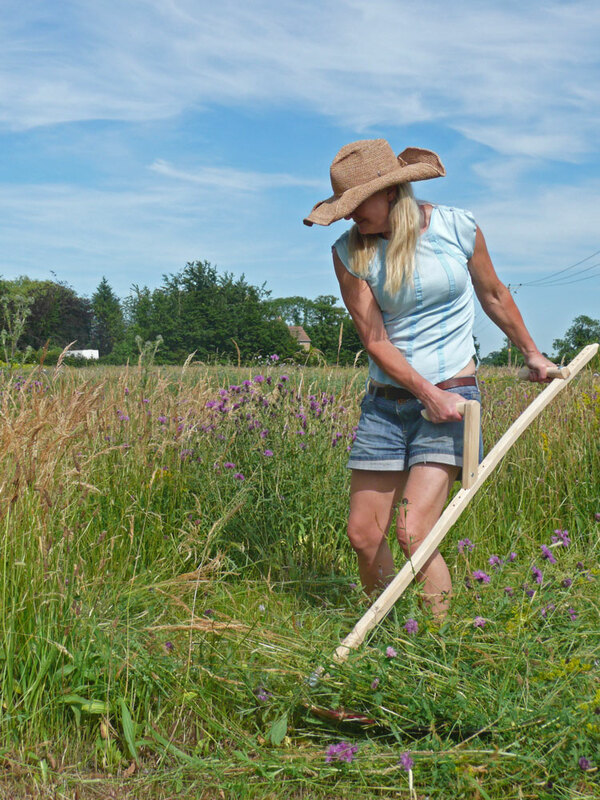 New scythes come with a factory sharpened blade which will cut straight out of the packet, but after just 5 - 10 minutes mowing it will have lost some of its edge and need re-honing. Blade sharpening skills are essential to learn from the outset. The first essential technique is honing; sharpening the edge of the blade with a whetstone. In the field you typically hone every 5-10 minutes whilst mowing. After about 4 - 8 hours mowing and honing the blade will benefit from peening (hammering to maintain and reshape the bevelled edge). Peening is usually done back at base between sessions. Peening is another skill that takes practice to get best results. A chainsaw file is a reasonable, if inferior, substitute where peening is not practical. Mowing a meadow with a scythe provides a much more intense sensory engagement with the grassland than is ever possible with a machine. You will learn far more about its character, composition and structure and how this varies across your site. You will discover over time the effect of different management regimes has, how more frequently mown grassland encourages fine grass and herbs whilst infrequent late mowing favours coarse vegetation. Even on large site which is cut by machine it is worth mowing sections with a scythe just to gain a better feel and understanding of the plant community growing there. Use of the scythe will teach you the importance of mowing meadows at the right time. You will soon discover areas which have been neglected or left too long ("over-stood"), areas which have become hard to mow because the vegetation has now collapsed, become entangled and rotting at the base. This neglect compromises flowering plant diversity, but also makes mowing difficult. Rough tussocky grassland that has been left uncut deliberately as a shelter for insects and small mammals can be tackled when needed with a scythe, pick the best time for your site and accept that work rates will be slower.